Photograph Al Capone in Philadelphia, Pennsylvania, where he had been arrested and charged with carrying a concealed weapon, 1929. Alphonse Gabriel Capone (January 17, 1899 – January 25, 1947), popularly known as Al "Scarface" Capone, was an American gangster who led a crime syndicate dedicated to the illegal traffic of alcoholic beverages during the time of their prohibition in the 1920s and 1930s. Born in Brooklyn, New York to Neapolitan emigrants, he began his career in Brooklyn before moving to Chicago and becoming the boss of the criminal organization known as the Chicago Outfit (although his business card reportedly described him as a used furniture dealer). By the end of the 1920s, Capone had gained the attention of the Federal Bureau of Investigation following his being placed on the Chicago Crime Commission's "public enemies" list. Although never successfully convicted of racketeering charges, Capone's criminal career ended in 1931 when he was indicted and convicted by the federal government for income tax evasion. He remains the single most famous organized crime figure in American history. Capone was born to Gabriele Capone and his wife Teresina Capone in Brooklyn, on January 17, 1899. Gabriele was a barber from Castellammare di Stabia, a town about 15 miles south of Naples, Italy. Teresina was a seamstress and the daughter of Angelo Raiola from Angri, a town in the province of Salerno in southwestern Italy. The Capones had emigrated to the United States in 1894, and settled in the Navy Yard section of Downtown Brooklyn. When Al was fourteen, the Capone family moved to 21 Garfield Street, in Carroll Gardens, Brooklyn. The new home was where Al met gangster Johnny Torrio and Mae Josephine Coughlin, whom he married a few years later. Gabriele and Teresina had seven sons and two daughters, of whom Alphonse was the fourth oldest. Capone's life of crime began early. As a teenager, he joined two gangs, the Brooklyn Rippers and the Forty Thieves Juniors, and engaged in petty crime. He quit school in the sixth grade at the age of 14, after being expelled for punching a teacher. He then worked odd jobs around Brooklyn, including in a candy store and a bowling alley. After his initial stint with small-time gangs, Capone joined the notorious Five Points Gang, headed by Frankie Yale. He began working as a bartender and a bouncer at Yale's establishment, the seedy Harvard Inn. It was there that Capone was slashed in the face during a fight over a girl. Less than two weeks after that fight, the man who had cut Capone (the girl's brother) was found dead with a slit throat. The scar on Capone’s face stayed for life, earning him the nickname 'Scarface' which he truly disliked, allegedly killing another man for using it. On December 30, 1918, Capone married Mae Josephine Coughlin, who shortly before their marriage had given birth to his son, Albert Francis ("Sonny") Capone. The couple lived in Brooklyn before moving to Amityville, Long Island, to be close to "Rum Row," a line of ships that anchored beyond the three-mile limit to off-load their cargoes of alcoholic beverages onto speed boats during national prohibition (1920-1933). While Capone was still working for Frankie Yale, he is thought to have committed at least two murders before being sent to Chicago in 1919, mainly to avoid the retribution of Bill Lovett. A violent lieutenant in the White Hand Gang, Lovett was busy searching for Capone, who had supposedly hospitalized one of his subordinates. Capone was familiar with Chicago, having been sent there previously by Yale in order to help crime boss James "Big Jim" Colosimo dispose of a troublesome group of Black Hand extortionists. Capone went to work for Colosimo's empire under Giovanni "Johnny" Torrio, another Brooklyn boy. The move set the stage for one of the most notorious crime careers in modern American history. Torrio immediately recognized Capone's talents and soon Capone was elevated to running the Four Deuces bar and given responsibility for much of the alcohol and prostitution rackets in the city of Chicago. With prohibition now in full effect, there was a fortune to be made in bootlegging. Colosimo's reluctance to move into this area of crime led to his murder on May 11, 1920, in the foyer of his own nightclub. Frankie Yale was later arrested for the murder, but the case collapsed through lack of evidence. Torrio was now in charge and promoted Capone to be his second in command. The Capone family then moved permanently to Chicago, buying a red-brick bungalow at 7244 South Prairie Avenue on the city's South Side. The house would serve as Al Capone's first headquarters. After the 1923 election of reform mayor William Emmett Dever in Chicago, the Chicago city government began to put pressure on the gangster elements inside the city limits. In order to locate its headquarters outside of city jurisdiction and create a safe zone for its operations, the Capone organization muscled its way into Cicero, Illinois. This led to one of Capone's greatest triumphs, the takeover of Cicero's town government in 1924. The 1924 town council elections in Cicero became known as one of the most crooked elections in the Chicago area's long history, with voters threatened at polling stations by thugs. Capone's mayoral candidate won by a huge margin, but only weeks later announced that he would run Capone out of town. Capone met with his puppet-mayor and brazenly knocked him down the town hall steps, a powerful assertion of gangster power. He had little trouble from Cicero authorities thereafter. For Capone, this period was marred by the death of Capone's brother Frank at the hands of the police. As was the custom among gangsters, Capone signaled his mourning by attending the funeral unshaven, and he cried openly at the gathering. Much of Capone's family put down roots in Cicero as well. In 1930, Capone's sister Mafalda's marriage took place at St. Mary of Czestochowa, a massive Neogothic edifice towering over Cicero avenue in the so-called Polish Cathedral style. Severely injured in a 1925 assassination attempt by the North Side Gang, the shaken Torrio turned over his business to Capone and returned to Italy. Capone was notorious during the Prohibition era for his control of large portions of the Chicago underworld and his bitter rivalries with North Side gangsters such as Dion O’Banion, Bugs Moran, and O'Banion lieutenant Earl "Hymie" Weiss. Although the Capone organization was making a great deal of money from illegal prostitution and alcohol (some estimates were that between 1925 and 1930 it was grossing $10 million a year), Capone avoided prosecution by intimidating witnesses and bribing city officials, including the Mayor of Chicago William "Big Bill" Hale Thompson. Capone was reputed to have had several other retreats and hideouts including Brookfield, Wisconsin; Saint Paul, Minnesota; Olean, New York; French Lick and Terre Haute, Indiana; Dubuque, Iowa; Hot Springs, Arkansas; Johnson City, Tennessee; and Lansing, Michigan. In 1928, Capone bought a retreat on Palm Island, Florida. It was shortly after this purchase that he orchestrated the most notorious gangland killing of the century, the 1929 St. Valentine's Day Massacre in the Lincoln Park neighborhood on Chicago's North Side. Although details of the killing of the seven victims in a garage at 2122 North Clark Street are still in dispute and no one was ever indicted for the crime, their deaths are generally linked to Capone and his henchmen, especially Jack "Machine Gun" McGurn, who is thought to have led the operation, using Thompson submachine guns. By staging the massacre, Capone was allegedly trying to dispose of his arch rival, Bugs Moran, who controlled gang operations on the North Side of Chicago. Moran, spotting what he thought to be a police car, decided to keep walking, and did not enter the garage, thus escaping the slaughter. Throughout the 1920s there were a number of attempts to assassinate Capone. He was shot in a restaurant and his car was riddled with bullets more than once. However, most of the would-be assassins were incompetent, and Capone was never seriously wounded. Capone often tried to whitewash his image to be seen as a community leader. For example, he started a program, which was continued for decades after his death, to fight the childhood disease of rickets by providing a daily milk ration to Chicago school children. Also, during the depression, Capone opened several soup kitchens for the poor and homeless. Capone prided himself as a man with style. If he ever killed someone himself, or one of his henchmen killed an important person, hundreds of dollars worth of flowers was sent to the funeral. In one fight between Capone's men and another gang, an innocent woman was shot, not fatally, and required hospital treatment. Capone personally paid for all the hospital fees. Capone was a high-visibility target for prosecutors because of his status as a celebrity. On the advice of his publicist, he did not hide from the media and, by the mid-1920s, began to make public appearances. When Charles Lindbergh performed his famous transatlantic flight in 1927, Capone was among the first to push forward and shake his hand upon his arrival in Chicago. He gained a great deal of admiration from many of the poor in Chicago for his flagrant disregard of the prohibition law that they despised. He was viewed for a time as a lovable outlaw, partially due to his extravagant generosity to strangers and often lending a hand to struggling Italian-Americans. His night club, the Cotton Club, became a hot-spot for new acts such as Charlie Parker and Bing Crosby. He was often cheered in the street, and it was only the brutal murders of the St. Valentine's Day massacre that made people view Capone, once again, as basically a killer and socially unacceptable. Al Capone's privileged cell in Eastern State Penitentiary, where he spent ten months in 1929-1930 for possession of a concealed weapon. Capone spent ten months in Eastern State Penitentiary on weapons charges from 1929-30. His ability to pay off guards and other prison officials made his life there relatively comfortable. Federal crime fighters, however, were also after him. Capone headed a list of "public enemies" corrupting the city compiled by the chairman of the Chicago Crime Commission, Frank J. Loesch, in April 1930. The list was published by newspapers nationwide, and Capone became known as "Public Enemy No. 1." Pursuing Capone were Treasury agent Eliot Ness and his hand-picked team of incorruptible U.S. Prohibition agents, "The Untouchables," and internal revenue agent Frank Wilson of the Treasury Department's Bureau of Internal Revenue. During a routine warehouse raid, they discovered in a desk drawer what was clearly a crudely coded set of accounts. 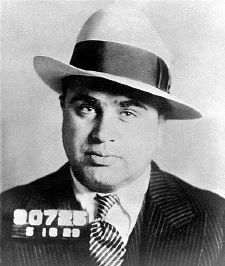 Ness then concentrated on pursuing Capone for his failure to pay tax on this substantial illegal income. This story has become a legend and the subject of many books and films. Capone was tried in a highly publicized, federal-court trial in 1931. Hollywood film star Edward G. Robinson, who played a Capone-like character in the movie Little Caesar, attended the trial for one day to observe Capone, the gangster role model. Capone pleaded guilty to the charges on advice of his legal counsel hoping for a plea bargain. But after the judge refused his lawyer's plea offers and the jury was replaced on the day of the trial to frustrate Capone's associates' efforts to bribe or intimidate the original panel, Capone was found guilty on five of 22 counts (three felonies and two misdemeanors) of tax evasion for the years 1925, 1926, and 1927 and willful failure to file tax returns for 1928 and 1929. Capone's legal team offered to pay all outstanding tax and interest and told their client to expect a hefty fine. Capone turned crimson with rage as the judge sentenced him to eleven years in a federal prison and one year in the county jail. He also had to pay substantial fines and costs, leading up to $50,000. In May 1932, Capone was sent to a tough federal prison in Atlanta, but was able to take control and obtain special privileges. He was then transferred to Alcatraz, where tight security and an uncompromising warden ensured that Capone had no contact with the outside world. Capone entered Alcatraz with his usual confidence, but his isolation from his associates and the repeal of Prohibition caused his empire to wither. He attempted to earn time off for good behavior by being a model prisoner and refusing to participate in prisoner rebellions. However, when Capone attempted to bribe guards to obtain special treatment, he was sent to solitary confinement. Alcatraz: Capone was the prison's most famous inmate. Capone earned the contempt of many of the inmates in Alcatraz when he refused to take part in a prisoners' strike after a sick inmate, accused of malingering, was denied medical treatment and died. Continuing his work in the prison laundry, Capone was continually harassed by other prisoners and often called a "scab" or "rat." He was eventually allowed to remain in his cell until the strike was resolved. Eventually assigned to mopping up the prison bathhouse, Capone was nicknamed the "wop with the mop" by inmates. He was later stabbed in the back by a fellow prisoner. Capone was hospitalized for a week. He suffered further harassment and unsuccessful attempts on his life throughout his term. Meanwhile, Capone's mental state began to deteriorate. Among other things, he would repeatedly make and unmake his bed for hours. At times, Capone refused to leave his cell at all, crouching in a corner and talking to himself in Italian or, according to some, complete gibberish. He began telling people that he was being haunted by the ghost of James Clark, a victim in the St. Valentine's Day Massacre. Capone completed his term in Alcatraz on January 6, 1939 and was transferred to the Federal Correctional Institution at Terminal Island in California to serve his one-year misdemeanor sentence. He was released on November 16, 1939, spent a short time in a hospital, and then returned to his home in Palm Island, Florida. Capone's control and interests within organized crime had decreased rapidly during his imprisonment, and he was no longer able to run the Outfit on his release. He had lost weight, and his physical and mental health had declined most noticeably. His obvious dementia was probably caused by the third stage of untreated syphilis that Capone had contracted in his youth. On January 21, 1947, Capone had an apoplectic stroke. He regained consciousness and started to improve, but contracted pneumonia on January 24, and suffered a cardiac arrest the next day. Capone was originally buried in Mount Olivet Cemetery, in Chicago's far South Side between the graves of his father, Gabriele, and brother, Frank. However, on March 1950, the remains of all three family members were moved to Mount Carmel Cemetery in Hillside, Illinois, west of Chicago. “Al Capone is America's best known gangster and the single greatest symbol of the collapse of law and order in the United States during the 1920s Prohibition era.” Capone's persona and character have been used in fiction as a model for crime-lords and criminal masterminds ever since his death. His accent, mannerisms, facial construction, sometimes his physical stature, type of dress, and often even parodies of his name are found in various cartoon series villains as well as some movies. These characters are often shown as wily and crafty, rather than contemptible, criminal characters. One of the most notorious American gangsters of the twentieth century, Capone has been the subject of numerous articles, books, and films. ↑ In the early 1950s, the name of the bureau was changed to Internal Revenue Service. ↑ For court decisions regarding Al Capone and his tax problems, see Capone v. United States, 56 F.2d 927, 3 U.S. Tax Cas. (CCH) paragr. 885 (7th Cir. 1932), cert. denied, 286 U.S. 553 (1932); and United States v. Capone, 93 F.2d 840, 38-1 U.S. Tax Cas. (CCH) paragr. 9011 (7th Cir. 1937), cert. denied, 303 U.S. 651 (1938). ↑ History Files, Al Capone Retrieved June 28, 2007. All links retrieved November 7, 2016. Obituary, NY Times, January 26, 1947 Capone Dead At 48; Dry Era Gang Chief. www.nytimes.com. 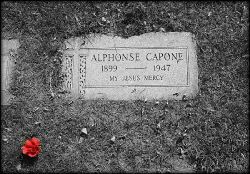 Find-A-Grave Alphonse ‘Al’ Capone. www.findagrave.com. An article on the Brothers Capone. crimemagazine.com. This page was last modified on 15 February 2019, at 15:18.